I grew up living on top of a grocery store. Literally. My parents owned a small town Saskatchewan grocery store with living quarters upstairs. Grocery shopping as a kid consisted of running down stairs at supper time to pick up the ingredients mom required. Anything we wanted was always on hand. Needless to say, after I moved out there has been a gradual evolution of my grocery shopping habits. When I first moved in with Mike, I drove him nuts trying to buy and keep on hand anything I might feel like for supper on any given day. After I overcame that little compulsion, I developed fairly average grocery shopping skills – I didn’t go overboard on items, but I also didn’t pay too much attention to how much something I wanted cost. After we made the decision to travel, there was yet another evolution – budget shopping. Pretty much everything I buy now is on sale or somehow discounted. Take last weekend’s grocery trip for example – I took full advantage of the 10 for $10 sale at my nearest Coop Marketplace. 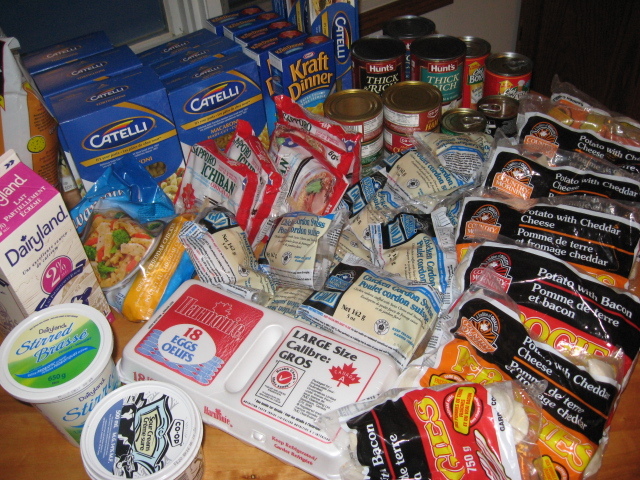 I loaded up on boxes of pasta, bags of perogies, frozen chicken cordon bleus, canned meat, and nearly everything else I could get my hands on for $1.00 each. All said and done, I ended up with 111 individual meals (or 55 meals for the two of us) for only $55. Not too shabby. What about when we feel the need to splurge? Not a problem – consider Valentine’s Day. In true Frugal February fashion, we forwent the fancy meal out and splurged at home – Veal Parmesan (for $1.25 a cutlet), homemade pasta (thanks to Mike), homemade tomato sauce (using canned tomatoes that were about $1.00 a can), and chocolate lava cakes. I even got a box of Valentine’s chocolates – post V-day at 70% off, of course. Wow! That’s the frugalest grocery shop ever!! Good work! I just have to say one thing: love the post Valentine’s Day discount on chocolate!! Woot!